Taking one of the many Lake Mead tours is a a great way to spend the day away from the bustle of Sin City. There are a wide assortment of excursions that have you exploring the Lake Mead National Recreation Area, the Hoover Dam and the Colorado River. You have a great variety of ways to see the largest man-made body of water in the Western Hemisphere from peddling on a mountain bike to maneuvering an ATV to cruising on a jet ski and you can even take a trail run along the Historic Tunnel Trail. The excursions offer many other exciting options too like going to a shooting range, taking a swim in the Colorado River or you can add-on a stunning helicopter flight to Grand Canyon National Park. Whether you want to take the family or just your loved one, there is an ideal excursion to Lake Mead to please everyone.. 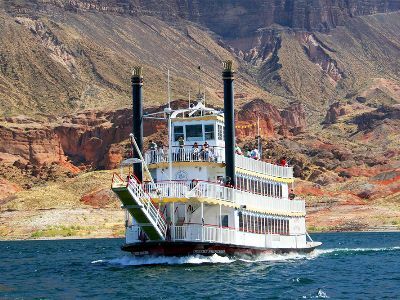 The Hoover Dam and Lake Mead Lunch cruise is perfect for relaxing and enjoying the natural scenery while having a perfectly prepared meal. Begin your Lake Mead tour with an easy bus pick-up from your hotel. You will then view the Hoover Dam from top to bottom on a 90-minute guided tour which starts at the visitor’s center and includes an informative movie about one of the greatest engineering feats known to man. There is plenty of time to explore the Boulder Dam Museum and its many exquisite exhibits on the history and natural environment that surround the Hoover Dam on your way to the generator room. From Hoover Dam you will travel onward to the splendors of Lake Mead. Once on board the Desert Princess- a stunning historical version of a Mississippi River steamboat complete with a huge paddle wheel as well as two levels of indoor climate controlled seating and a third level containing an observation deck-you will experience the adventure of Lake Mead. The Desert Princess is an oasis to enjoy a beautifully prepared lunch, while you are cruising through the blue waters of Lake Mead. You can take fabulous photographs of wildlife, view several islands such as Sentinel and Boulder. You won't miss any of the stunning steep cliffs or the Arizona Paint Pots that have made Lake Mead a favorite for many people. The last stops on this 6-hour finely crafted Lake Mead tour are at the world famous Ethel M. Chocolate Factory as well as the Botanical Gardens in Henderson. Your day is complete with a bus drop off at your hotel. The Lake Mead Desert Princess Dinner cruise will be the highlight of your Las Vegas experience. Enjoy the sunset while the rays of natural light paint the surrounding mountains in brilliant colors as you enjoy a splendid dinner. The Desert Princess is an absolute gem of an historic Mississippi River steamboat style complete with an enormous paddle wheel. The Desert Princess is also very spacious and U.S. Coast Guard certified for 300 passengers and 10 crew members. The Desert Princess has three levels that include two climate-controlled decks and a third observation deck for all of your lounging pleasures. 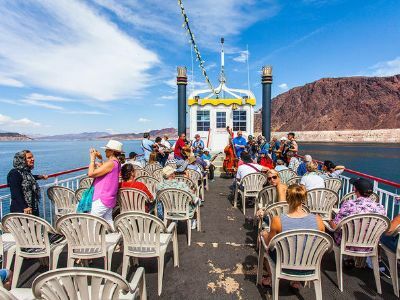 During your 120-minute Lake Mead cruise you will enjoy a spectacularly prepared dinner of beef, chicken, seafood or pasta while sitting in the surrounding elegance of the Desert Princess. After dessert you can stroll on the observation deck or just sit back and enjoy the comfort of the Desert Princess. Spend a fascinating day exploring one of the greatest achievements of modern day engineering feat in the Hoover Dam and view Lake Mead which is the largest body of man-made water in the Western Hemisphere. Later in the tour you will float down the mighty Colorado River in a raft. First meeting at the tour guides office you will arrive at Hoover Dam in a specialized touring vehicle-the Pink Jeep, or a Tour Trekker-that only seats 10 people. Once at Hoover Dam you will be given a guided tour that includes a spectacular documentary film on the history and construction of this man made marvel. You will be guided to the observation room that exhibits the actual massive electric turbines working. You also have the opportunity to experience once-in-a-lifetime vistas of the Colorado River and Lake Mead National Recreational Area. You will continue your adventure from the Lake Mead overlook being transported down the Lower Portal Road along the Colorado River. Imagine the workers taking the same path on their way to work every day as you travel back in time viewing such historic sites such as the original gauging station as well as the dynamite storage bunkers. When you reach the Colorado River you will be pleasantly surprised by the beautiful sights. As you float down the Colorado River you will have unspoiled close up views of the Hoover Dam and its enormous power facility as your guide offers interesting historical facts about the construction of this massive project. The views of the Black Canyon are spectacular while floating effortlessly down the mighty Colorado River. 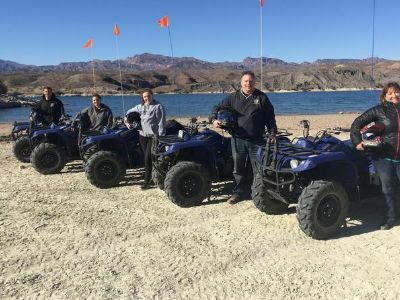 If you are searching to take a break from Sin City and raise your adrenaline level then a perfect a Lake Mead tour for you to try is the ATV Tour of Lake Mead National Recreational Area from Las Vegas. Your 6.5-hour journey starts with complimentary hotel pick-up service when you meet your guide and transported to Lake Mead National Recreational Area. As you travel your expert guide will inform you of the interesting history behind the Hoover Dam, the Colorado River and the mining districts that surround Eldorado Canyon. Once you reach the Lake Mead National Recreational Area you will be outfitted with an ATV and all the necessary safety equipment before you start your journey. During your 3-hour ATV driving adventure your eyes will pop from the beautiful scenery that includes sheer cliffs, desert landscapes as well as plenty of wildlife. After maneuvering your ATV for 1.5-hour you will stop next to the Colorado River where you can indulge in a free lunch and take a quick dip in the water to cool your body off. When you finish your ATV ride you will make a stop at Hoover Dam on the way home for photographs. Your excursion concludes with drop-off service at your hotel. 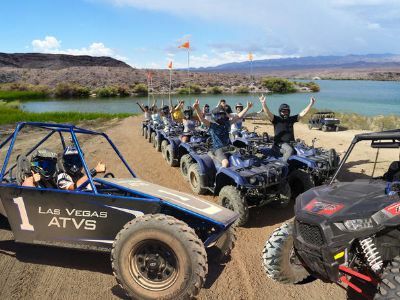 One of the best action packed Lake Mead tours that has you driving an ATV, shooting a variety of guns as well as giving you a chance to fly over the Grand Canyon is the Shooting and ATV Tour from Las Vegas with Optional Doors-Off Helicopter Flight. 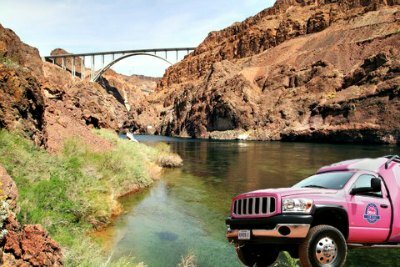 Your 7-hour adventure begins with complimentary hotel pick-up service when you meet your guide and are transported to the Hoover Dam for a 15-minute photo opportunity. As continue on your journey you will reach Lake Mead National Recreational Area where you will be outfitted with the necessary equipment for your incredible ATV ride along the lake. As you maneuver your ATV on a 22-mile journey you will be amazed at the stellar scenery that surrounds you and after a 2-hour ride you can take a quick dip in the lake to cool off. After you replenish your body with free lunch, you will continue your journey to the shooting range where you have a variety of packages to choose from that will have you shooting targets with an assortment of fire power. An add-on option on this Lake Mead tour is a 90-minute flight to the Grand Canyon where you will soar through the canyon taking in bird’s eye view of one of the Seven Natural Wonders of World. Your full day adventure concludes with drop-off service back at your hotel. If you are searching for a Lake Mead tour that offers a bit of exercise, beautiful scenery, history and is family-friendly, then you need to take the Hoover Dam and Lake Mead Bike Tour. Your 6-hour biking adventure begins with complimentary pick-up service from your hotel when you are transported to the Lake Mead National Recreation Area by your expert guide where you will be outfitted with all the necessary equipment. After you gear up you will start to peddle along newly opened trail that is ideal for all skill level of bikers. As you bike along the Historic Tunnel Trail that has you traveling downhill through five 25-foot tunnels you will be amazed at the wildlife, the gorgeous views of Lake Mead and the Hoover Dam as well as the colorful cliffs of Black Canyon. Passing through the last tunnel you will reach Lake Mead where you will enjoy a boxed lunch while taking in more of the unique scenery of the lake and Hoover Dam. Your peddling adventure concludes with drop-off service at your hotel. The Hoover Dam Mountain Bike Tour is an ideal Lake Mead tour for all levels of riders that has you peddling through stunning scenery while viewing one of the greatest engineering feats in the world. Your 7-hour journey begins with hotel pick-up service where you will meet your expert guide and travel to Lake Mead National Recreation Area. 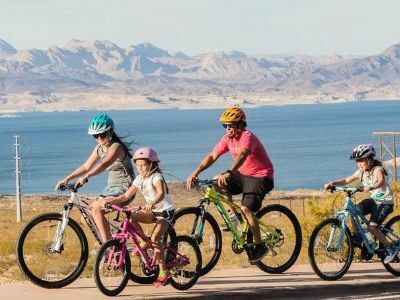 You start your mountain biking experience on a recently opened trail that has you peddling downhill until you reach the Lake Mead Visitor’s Center where you can take a quick dip in the lake before heading out to the Historic Tunnel Trail. Once at the trailhead you will bike 8-miles downhill through five tunnels along a historic rail line that was once used during the construction of Hoover Dam. During your biking adventure there are plenty of opportunities for wildlife viewing and the scenery of Lake Mead from above is beautiful. When you reach the dam you can decide to take an add-on option tour of the dam (extra fee) or just take some more photographs of the Colorado River, Lake Mead and Hoover Dam. Your biking journey concludes with drop-off service back at your hotel. Most people today like to get a little exercise while on vacation and a great way to stay fit in Sin City is to take the Las Vegas Trail Run Tour. 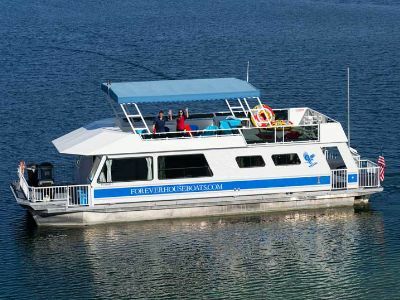 This 4-hour Lake Mead tour starts with complimentary pick-up service from your hotel where you will meet your guide and be transported to the trail head of the Historic Tunnels Trail. Once here you will be engulfed with beautiful scenery of the Mojave Desert and the gorgeous blue waters of Lake Mead which is the largest man-made body of water in the Western Hemisphere. The Historic Tunnels Trail is an 8-mile section of old rail line that was used by workers during the construction of the Hoover Dam until 1961 when the tracks were removed. 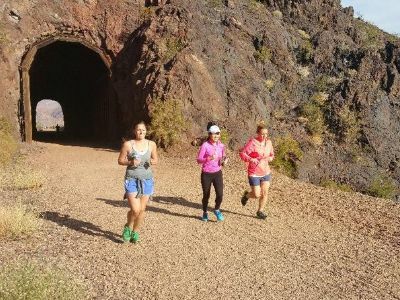 As you run along the trail you will pass through five 25-foot tunnels, have wildlife viewing opportunities and excellent views of Lake Mead before reaching the last few switch backs that take you to Hoover Dam. Once at the dam you can run across until you reach the end which has you standing in Arizona. Your running journey concludes with drop-off service back at your hotel. Experience one of the fastest growing recreational sports, stand-up paddleboarding, on the largest body of man-made water in the Western Hemisphere. 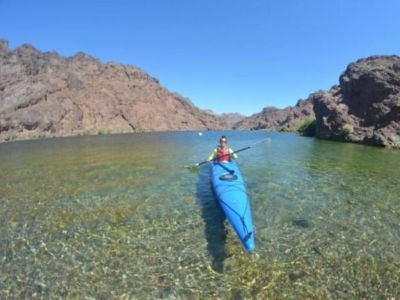 This well-crafted half-day Lake Mead tour will teach you the basics of stand-up paddleboarding as your instructor leads you through various lessons of stand-up paddleboarding tailored to your ability. Starting with a hotel pick up and a quick 30-mile drive to Lake Mead, which is ideal for learning how to stand-up paddleboard, you will be greeted with all of the equipment needed for your stand-up paddleboarding experience. Your instructor will lay out a sensible game plan based on your experience, maybe that is balancing for the novice or how to carve a better turn for the more experienced. Enjoy a quick history lesson of Hoover Dam and Lake Mead from your instructor and resupply your body with a boxed lunch. From here you might just float by an extinct volcano or journey out to the Boulder Islands. Either way you will enjoy the beautiful water that makes Lake Mead famous for recreation purposes and stand-up paddleboarding. Your 5-hour tour ends with a stop at Hemenway Park to view bighorn sheep and a drop off at your hotel. Maneuver your mountain bike down a trail that winds some 1,500 vertical feet through historic tunnels, bighorn sheep habitat on your way down to Hoover Dam and a kayak picnic lunch on Lake Mead. The first part of your Lake Mead tour will be mountain biking down a gorgeous trail that has a vertical elevation drop of 1,500 feet. Travel through five historic tunnels and the Hemenway Park, for bighorn sheep viewing. You will maneuver along the beautiful desert scenery that surrounds Lake Mead on your way to one of the most fascinating engineering projects in the world, the Hoover Dam. Just when you thought your legs were going to give out you arrive at Lake Mead, where kayaks await for the second portion of your journey. Enjoy a refreshing lunch after you take a plunge in Lake Mead on that hot day after you paddle to the outlying Boulder Islands. Once on the island you will have a prepared lunch waiting to restore your body’s nutrients. After lunch you will enjoy a nice kayak adventure with views of sunken wooden ships and marine life as you paddle on the serene waters of Lake Mead. Once you are dropped off at your hotel you will realize you just spent the perfect recreational day. Thinking about kayaking but don’t want to be confined to a Lake Mead tour group or guide? The half or full-day kayak rentals can offer you the freedom you seek. After arriving at the office you will be outfitted with your choice of either a “sit-inside” or sit-on-top” style of kayak and then transported to your point of put-in at Lake Mead. Most beginners choose the “sit-on-top” style of kayak and the more experienced paddler prefers the “sit-inside.” Outfitters will answer any and all questions you might have before you venture out. You can decide on your own destination based on your rental period of either four or eight hours. 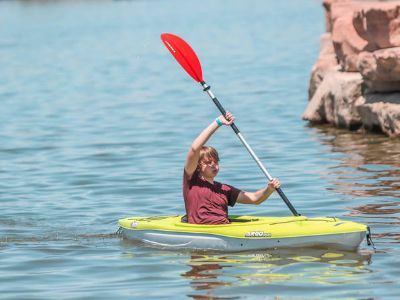 Paddle the serene waters of the largest man-made lake in the Western Hemisphere as you enjoy the surrounding landscape and animals that Lake Mead offers the visitor. Bring your own lunch or dinner and enjoy a relaxing meal on your own on Boulder Islands or simply paddle along the shoreline until you find a private cove to open your picnic basket and start resupplying your body. Your body will enjoy the activity and your mind will relish the peaceful scenery that you will be encountering on your kayaking journey. Renting a houseboat and living there is also a popular thing to do here! Think of a houseboat as of a hotel minus casino - they have everything you may need for a few days of vacation for your whole family and a few friends! Houseboats are very easy to operate - anyone can do that, besides you will get complete instructions from the marinas you choose to rent from: Callville Bay, Temple Bar . If you have never used a houseboat before, we recommend you to check out the Guide to Houseboats.